Stanford University’s School of Engineering has a history of offering courses on some pretty interesting products for free online. Many of them have been through Apple’s iTunes U program, and this latest is no exception. 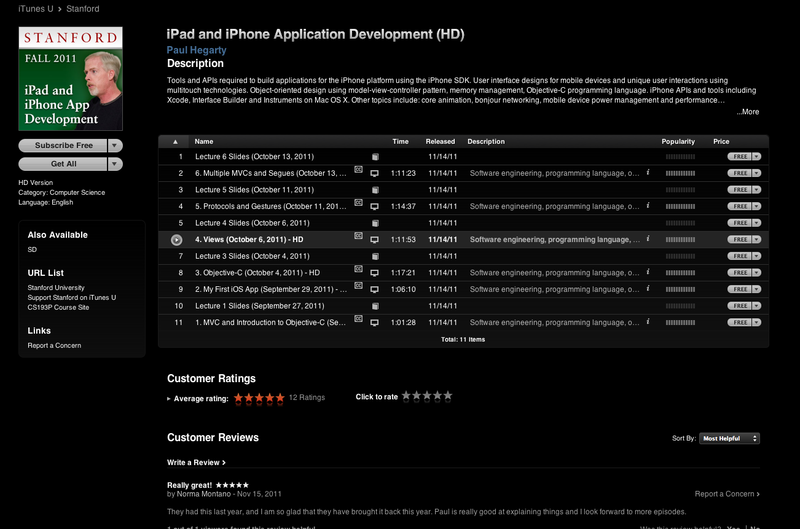 Stanford’s iPad and iPhone Application Development (CS193P) course is now available for free on iTunes U. The course includes lectures and lessons focused on iOS 5 app development. It’s broken out over 11 episodes that consist of videos and slides. Stanford’s stuff is generally very good and the ratings on this course are excellent so far. This is an update of the previous course, updated to take advantage of the new features of iOS 5. So if you’re interested in iOS app development, it would behoove you to check this out. The prerequisites are C language and programming experience and/or general object-oriented programming and UNIX experience.